In other news, spectacular clear sky at sunset, but no green flash. Wahoo for dinner, pan fried in a light batter, with oven baked chips. Fish n’ chips, that’s us. It is very cool, 70s during the day, high 60s at night. Seawater is 69F. Makes us wonder if the instruments are correct. You are probably wondering as well. Okay then, out comes the truth machine, aka FLIR thermal imager. Verdict: Cochise’s great room is 74F. Exterior aluminum is 74, night air drops to 69F and water 68F. We need to get out our thermals! Breeze is still forward, about 15 degrees to starboard, at ten knots. Current has gone slightly in our favor, and we have backed off the RPMs a touch. Eleven knots gets us to the barn at around 0200. We’d have to average 11.75 to arrive in daylight the afternoon prior. We can do that, but frankly, nobody is that anxious for this voyage to conclude, so we will dawdle along. We are taking a curve more to the north at this stage than a direct shot would entail. We’re doing this to pick up a stronger and earlier fair wind, with better ocean current prospects. We’ve been using an online weather routing website called PredictWind.com, which we were turned onto by John Henrichs (thanks John). They have an online polar builder for smooth and rough water, and output four weather models, so they are easy to compare. They also integrate ocean currents. So far the results have been positive. Speaking of positive, we are finally getting a handle on the best NAIAD stabilizer and Simrad AP 70 pilot settings. Both are doing their respective jobs well, without too much inter-machine discussion, and with minimum angle of attack. In other words, they are doing just enough and no more. This is comfortable and much more efficient drag-wise. Just how well stabilizer and pilot settings are doing their jobs will be seen in the last image. 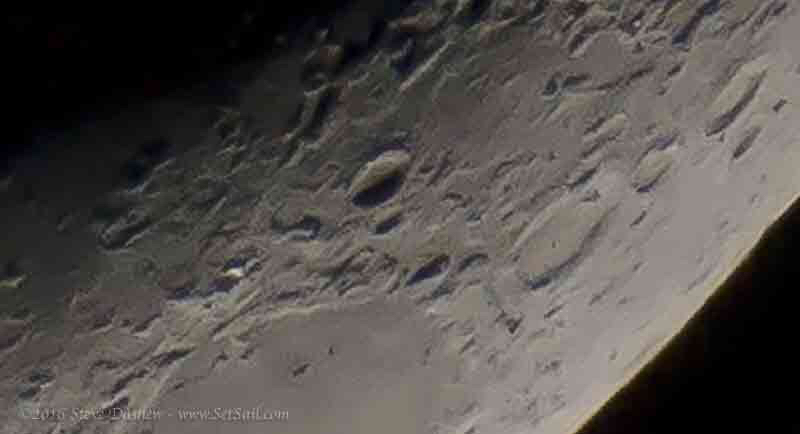 A tiny (600 out of 4432 pixels) slice of tonight’s moon. This was shot with a Canon 400mm F2.8 lens, 2X doubler, on a Sony 5300 body with a cropped sensor, which is in 35mm terms the equivalent of a 1280mm lens. The photo is so sharp we were able to blow it up 250% in Photoshop. We doubt the high compression required with Iridium will do this pic any favors, but when we get a fast connection we will upload a higher res copy. It has amazing clarity and detail for a terrestial shot, let alone a small yacht headed uphill. The crew has been hard at the chores list all day, and maybe tomorrow we will reward ourselves with a precious Marquesan pamplemousse. Right now it’s time for the equator crossing party. This entry was posted on Friday, November 4th, 2016 at 11:53 am and is filed under Dashew Logs, FPB 78, The Logs. Both comments and pings are currently closed. Fabulous photo of the moon!!!! Wonderful descriptions of life aboard COCHISE. Love every word, thank you! Dear Steve. If you like sashimi, try fresh wahoo (ono). Very good. Amazing you can take a sharp pic with a 1280mm lens in a moving yacht. Thats a reeeeeally stable boat. What was the shutter speed for the moon shot? The shutter speed was 1/800th of a second. About two stops dark, then brought back up in Light Room.